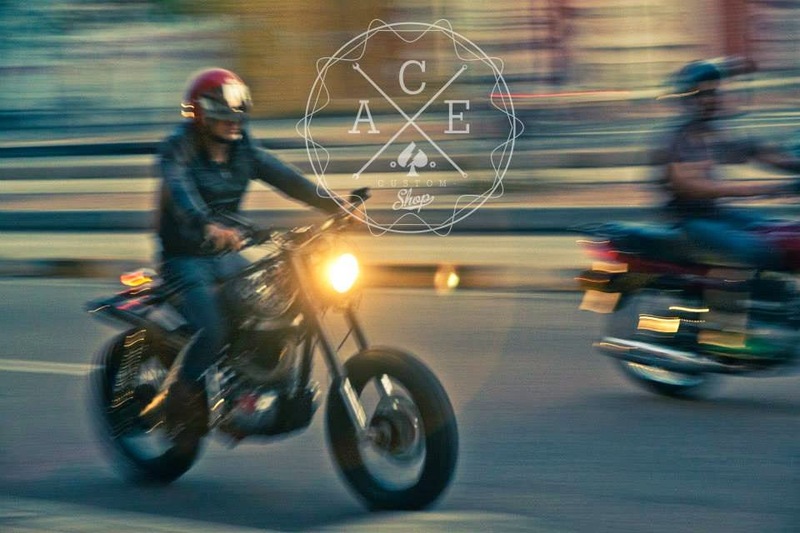 You’re more likely to spot an exotic sports car in Dubai than a classic custom motorcycle. Still, the bustling desert oasis hosts an eclectic blend of people—and a blossoming custom scene. 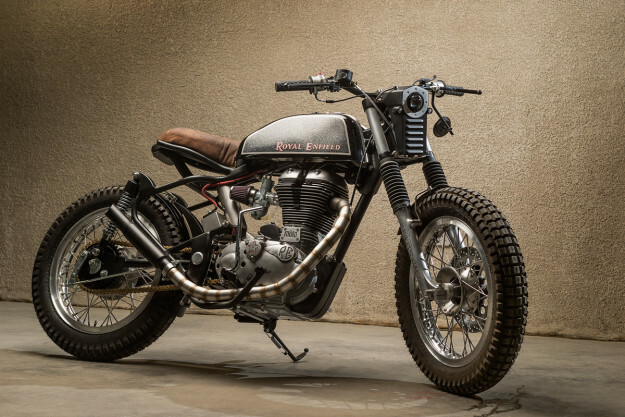 It’s also the home of möto Dubai: a relatively young outfit that recently took top honours in the recent Bikers Cafe build-off, with this unconventional Royal Enfield. 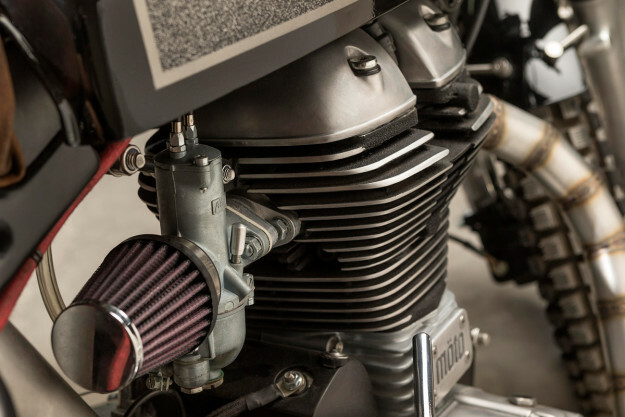 The guys also ditched the Enfield’s EFI system and installed a Hitchcocks Motorcycles Amal carb conversion kit—allowing them to tidy up the wiring significantly. The new TCI was tucked into a custom-made housing between the swingarm and engine, and the battery moved to a new hand-made battery box. The stock, bulky ignition switch was retained though—just to keep the original Enfield-branded key in use. The engine’s exterior received a significant refresh too, with the fins being hand filed to a perfect edge, painted and polished again. The unsightly starter motor was hidden behind a hand-shaped cover, before Marco spent the better part of sixty hours engraving various bits. 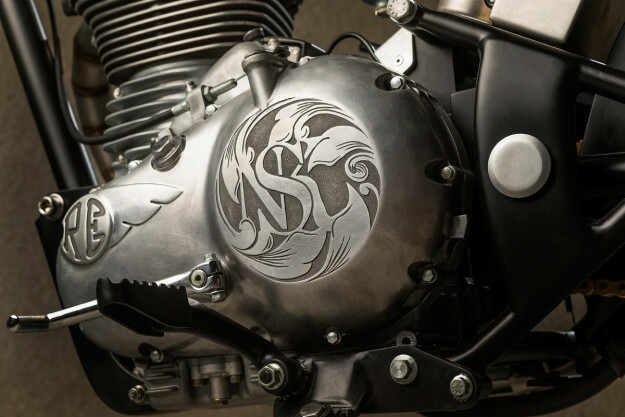 A stunning, stainless-steel exhaust was welded up to top it off. 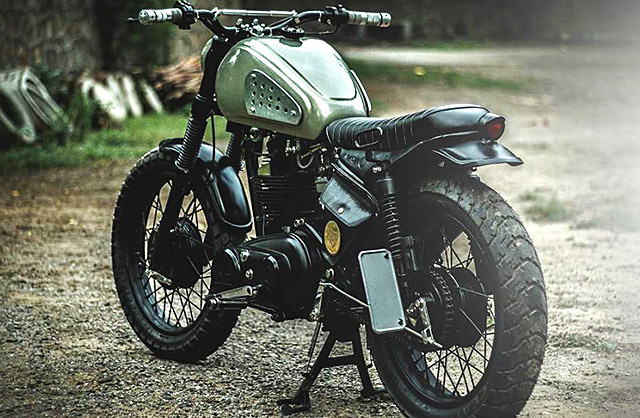 A Royal Enfield Electra front-end was fitted to give the bike a more scrambler feel, while keeping things brand-focussed. It’s matched to a set of new rear shocks from Dime City Cycles. The wheels are new too: they’re a pair of 18” Excel rims, laced up with stainless spokes by Buchanan’s in California and wrapped in Shinko rubber. möto polished up the hubs before sending them over, then polished the rims afterwards for a mixed, gloss-and-matte finish. Up front, the original, boxy rear license plate mount was re-purposed to house the headlight and front turn signals. The cockpit’s finished off with refurbished Honda CB350 controls, internal wiring, Biltwell grips and a Nissin master cylinder with a Goodridge braided brake line. 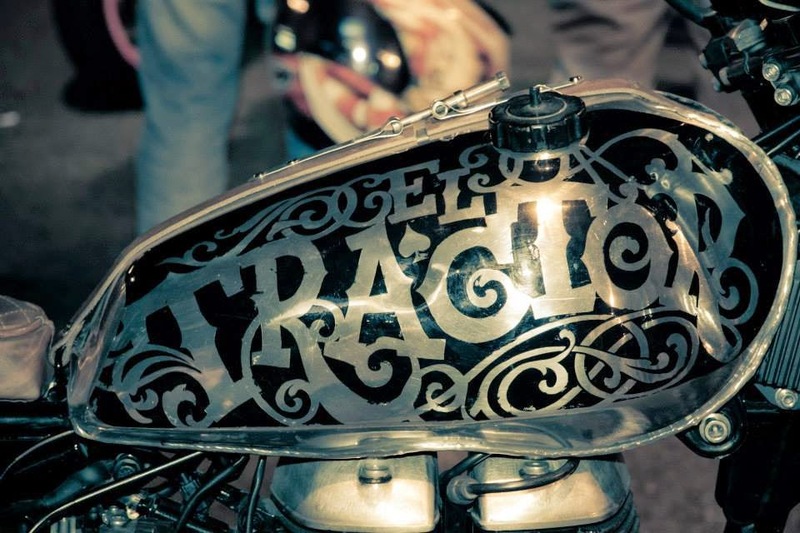 When it came to the last few parts, Marco and Antonie’s attention to detail began bordering on obsessive. 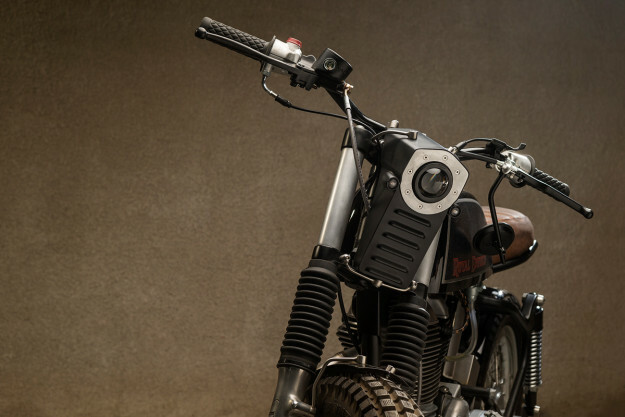 The rear wheel hugger is a completely custom affair, the foot controls consist of off-road parts welded to the stock mounts, and there’s even a hand-made bash guard, mounted on extended engine mount brackets. And if you look really closely, you’ll notice various bolts, caps and bushes—each machined from either aluminum or stainless steel, and each serving a specific purpose. 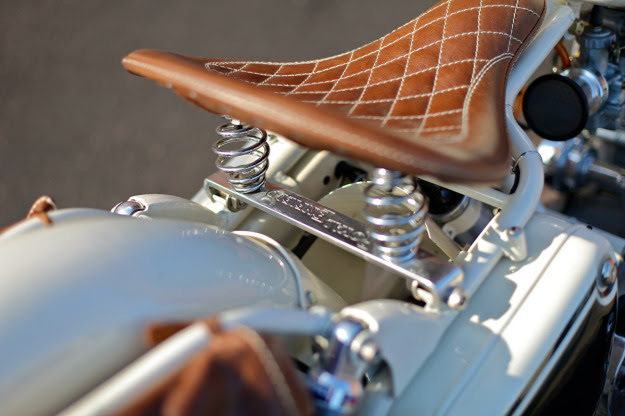 The final piece of the puzzle is the one-off seat—upholstered in locally-sourced camel leather. 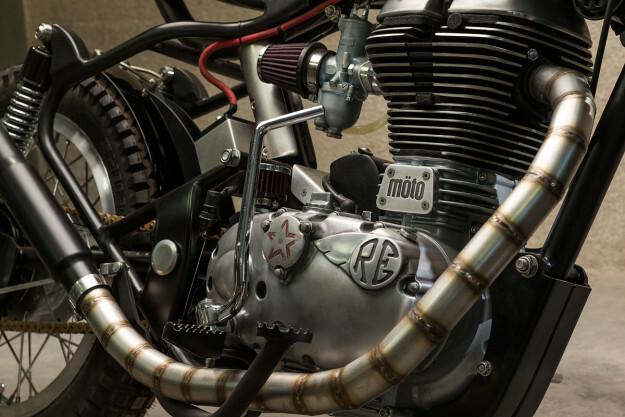 möto’s ‘NSK’ is fitting homage, and a worthy winner. Pat yourselves on the back, gentlemen. 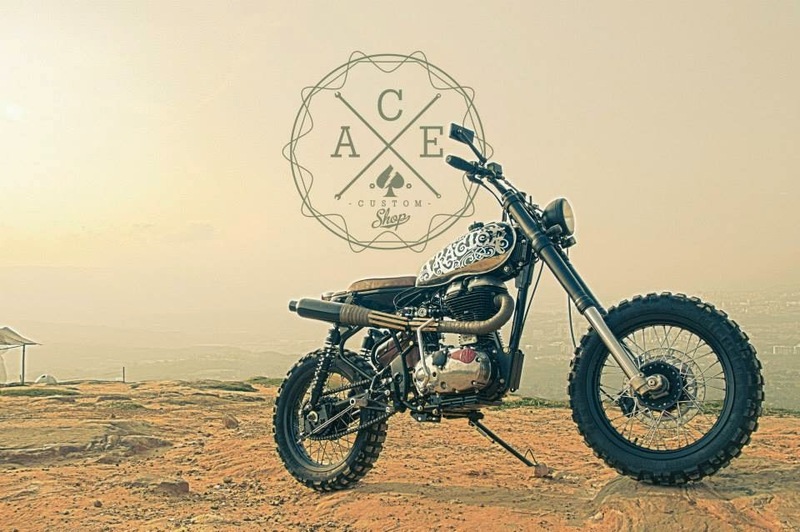 Antonie and Marco would like to extend their thanks to the Dubai community who supported them, particularly Djalal from Gecko Motorcycles and Frank Ortman. 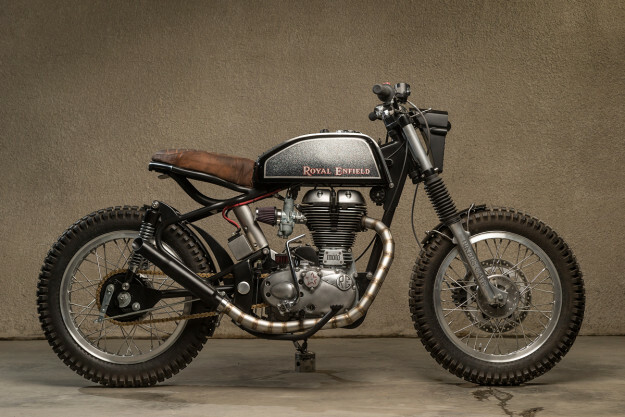 As of late, Royal Enfield has been in the news for all the good reasons. 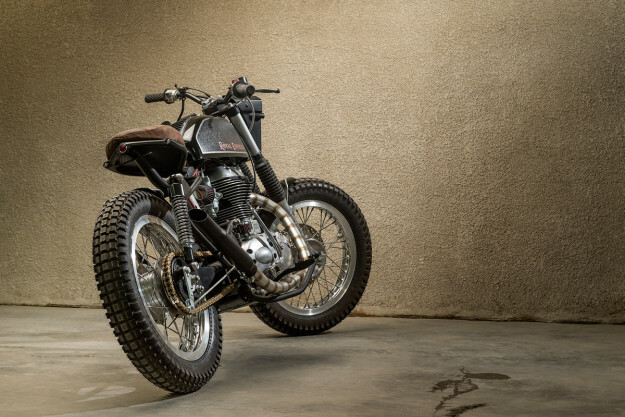 The Indian owned British-marque is grabbing the limelight and chewing into newsprint for their massive expansion plans, and of course, for their exciting launches up ahead. 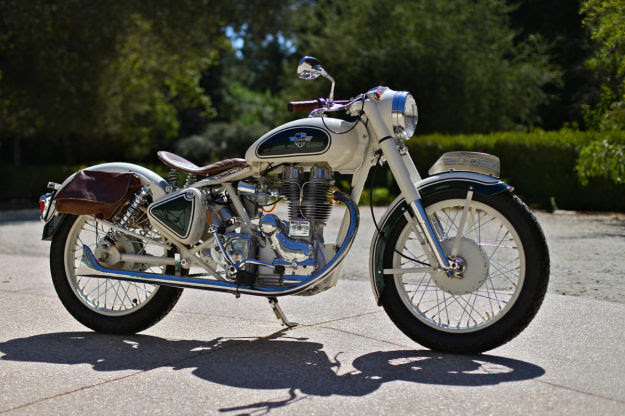 However, now we have got a hold of a piece of news that speaks of an all-original 1A Interceptor bike from the 1960’s. 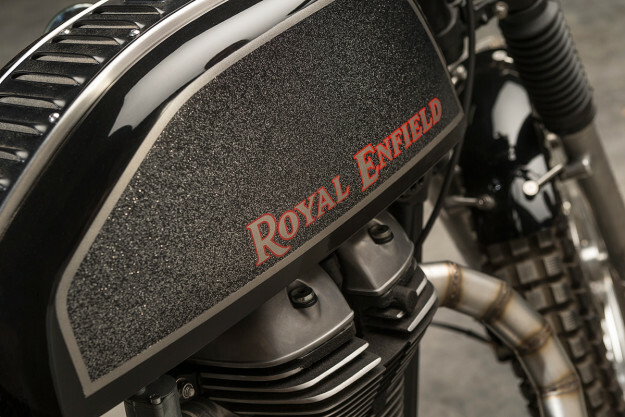 To the uninitiated, the Interceptor was made by Royal Enfield from 1960 to 1970 and during that period they even tinkered with the powerplant—kicking it up to a 750cc unit. 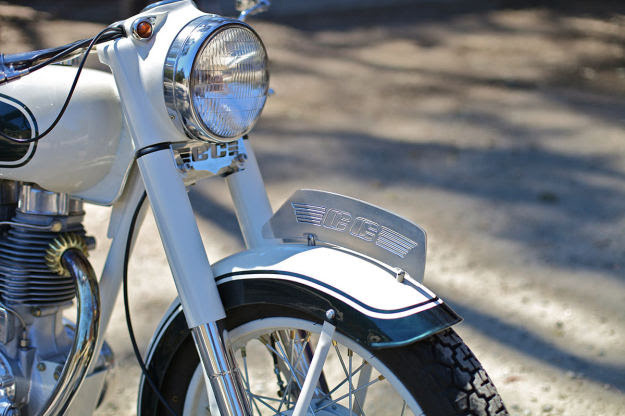 The 1A Interceptor was launched back in 1967 and is still a rare piece of classic bike machinery to obtain. Those who succeed in finding one will always be inclined to restore it to its previous glory. 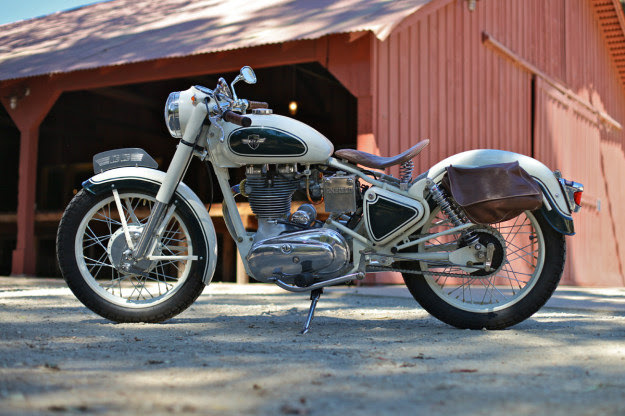 So when Charlie Giordano, who owns Tailgunner Exhausts, found one such 1A Interceptor in desperate need of some tender love and care, everyone hoped to see the bike getting a thorough restoration job. Well…it did get a new lease of life, but it wasn’t what everyone expected to see. The result was mind-blowing. Giordano chose to get a fresh sheet of paper and start from scratch in terms of the styling. 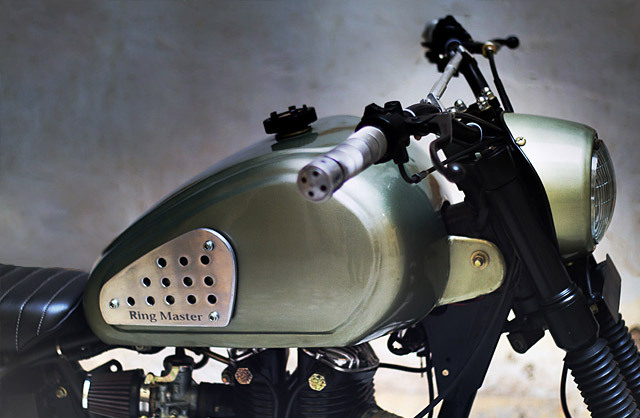 It did have to feature one of the finest of his Gatling Gun-inspired rotating exhaust systems, which we think is the one of the most ridiculously awesome things that can be retrofitted on to a motorbike. It’s more like Pacific Rim – dumb, but rad! But the sheer lunacy of this 1A Interceptor doesn’t end with its tailpipe that will surely make the cars behind you swerve off the lane. Giordano has borrowed cues from England during that era where this bike belonged once. Sample this: It has a wax-sealed “Boston” liniment bottle attached to the fork leg—filled to the brim with “a sailor’s daily ration of rum” per old Royal Navy Tradition. 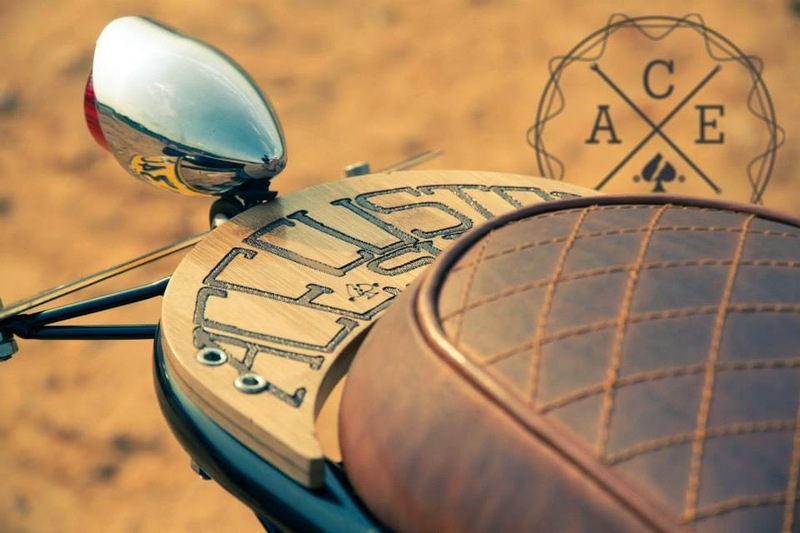 The battery box is made from wood cigar boxes and embellished with hand-hammered copper strips. It also has a pedestrian slicer on the front number plate. 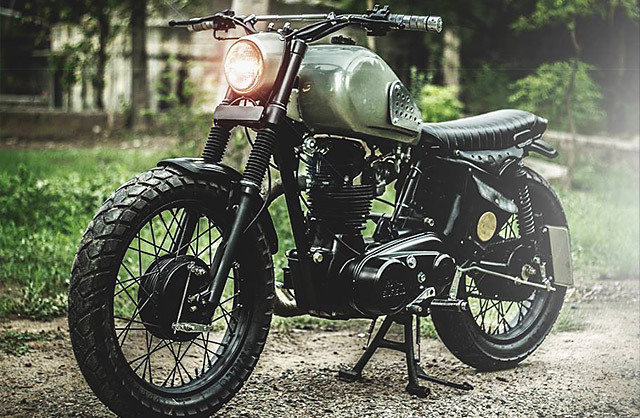 This bike has café racer genes written all over it—from the fender devoid wheels to the Manx-style fuel tank. And that gorgeous tail section! All of it was crafted using old techniques with the help of hand tools. We are the half that is very pleased. To this we call ... 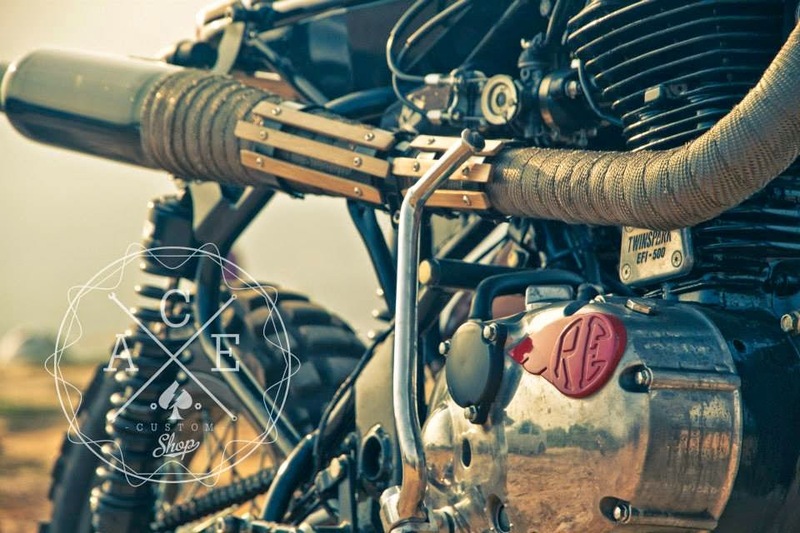 The Tractor is a Royal Enfield 500 efi , this engine has a feeling ... a tractor! low rpm torque ... feels awesome can tow a house! therefore needed better wheels, aluminum wheels , a front suspension WP inverted a KTM 450, Progressive rear suspension , exhaust tailored departing Royal star , aluminum tank XT 500, and of course, relocating the pump gasoline into a secondary tank .. new front fender subframe ... handmade gingerbread ... all to keep a look Scrambler / MX / Rat ... so there is a Rat fink hand illustrated on one side of the tank! and ... well ... another endless details that complement this construction. 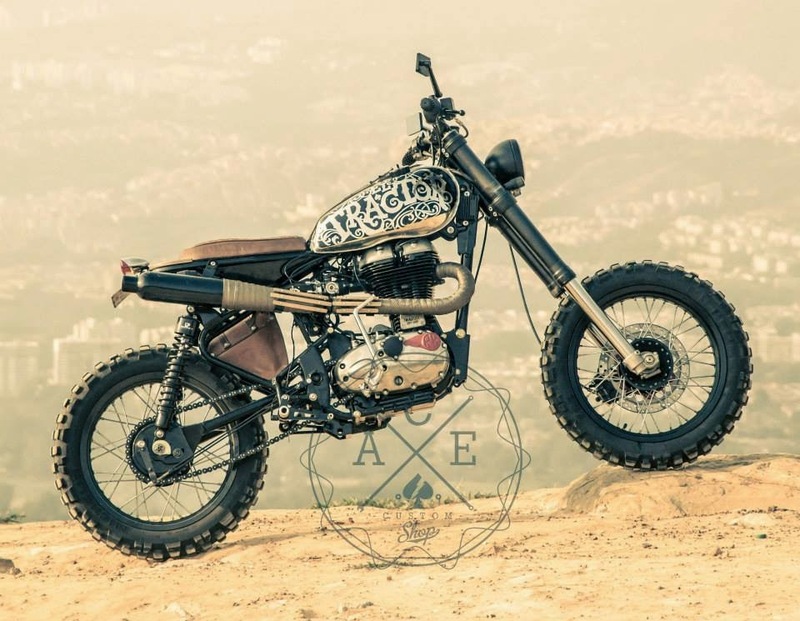 Royal Enfield motorcycles make a great platform for building custom bikes. 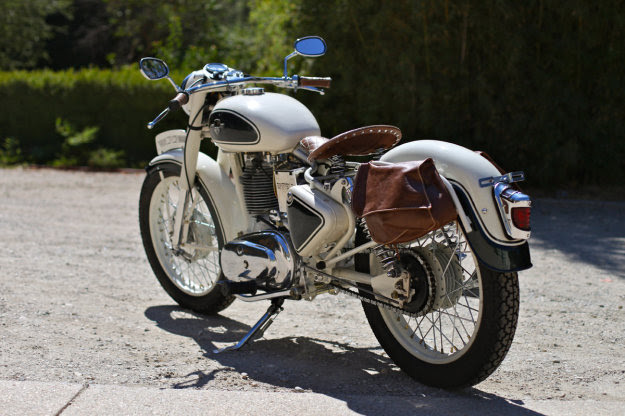 Old school Brit styling, reliable single cylinder engines and factory spoke wheels. 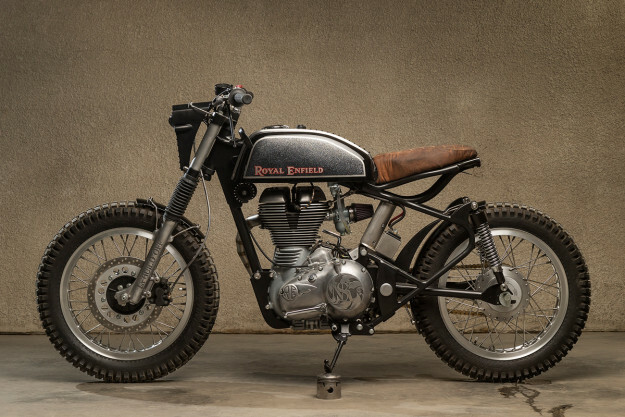 This is exactly what New Delhi based Bull City have done with their latest build, putting their skills to work on a Royal Enfield AVL 350cc, and producing something far removed from your everyday Enfield. With a build brief calling for an “old school thumper”, the Bull City workshop decided the idea has been done alot, and needs some special touches in order to stand out. 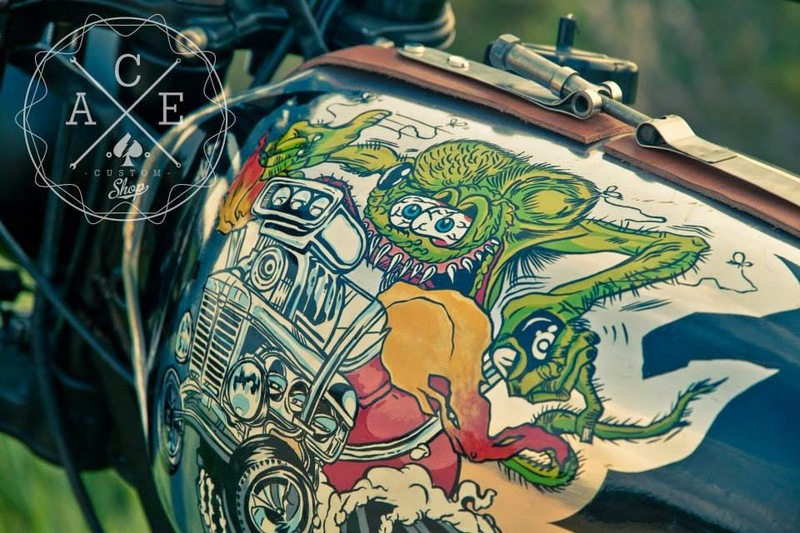 That is why there is a rhino-skin inspired paintjob on the tank for instance – which I’m pretty sure is a first for Pipeburn. Stripping the mid sized thumper back to basics, the clunky factory fenders were replaced with shorter ones, and the frame shaved of all superfluous bracketry. The toolbox is gone, replaced with a leather carrier bag mounted above the shorty pipewrapped exhaust. New framework has been mounted on the bike, and the battery box is sheet metal unit fabricated up by Bull City themselves. 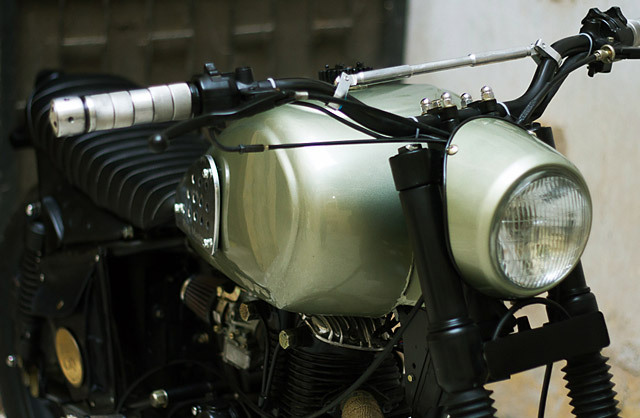 At the front end sits a set of custom built T riser bars, adorned with a unique headlight surround enveloping the Yamaha RX100 headlight. 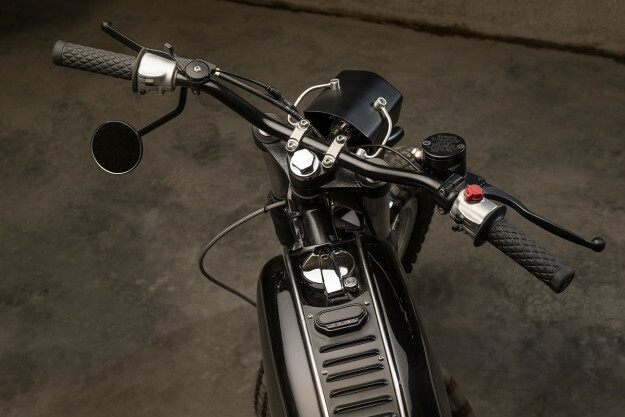 The handlebars are Proracer items, mounted up with aluminised grips. Rolling stock is made up of 18 inch rims, with 120 profile at the front and 130 profile at the rear. An impressive aspect of the build is the metal work carried out. The 22 litre fuel tank is a one off special, along with the ‘lightweight’ side plates. 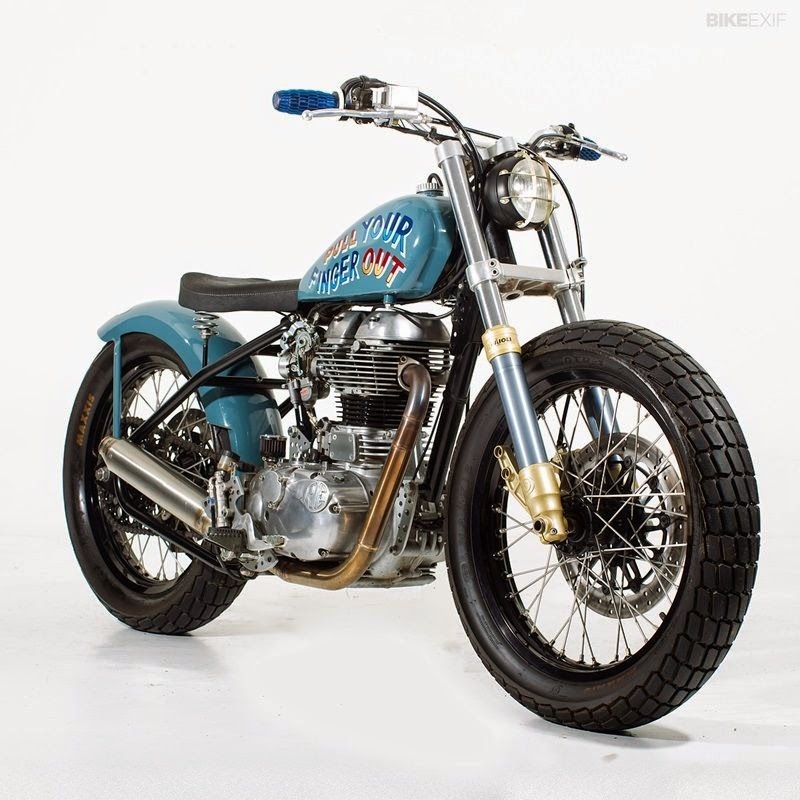 The foot pegs have been made from Royal Enfield engine internals, adding to the overall metallic touch to the build. 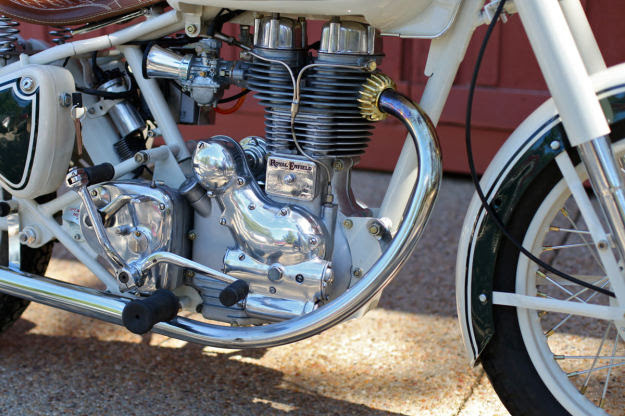 This is matched with the fuel tank cap fashioned from a main shaft sprocket. From the front to the back, there is little that hasn’t been aesthetically touched up over the course of the build. 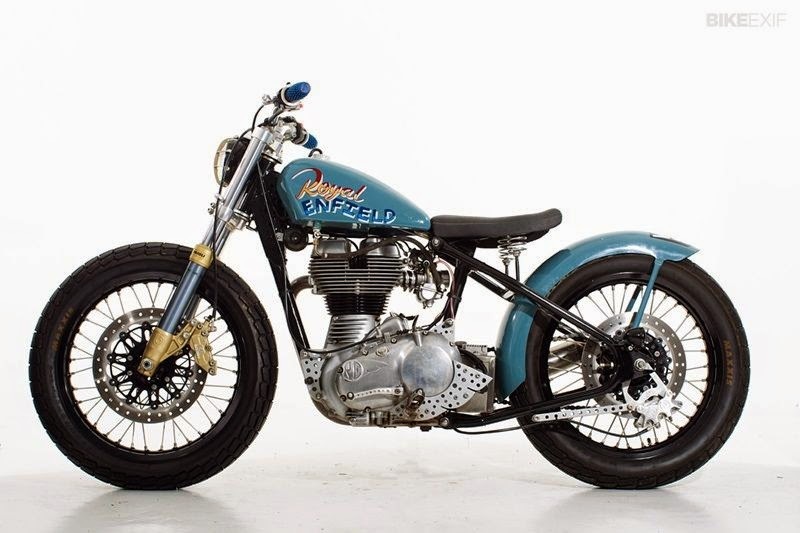 With much of the metal work coming from Bull city’s own workshop, this Royal Enfield is definitely a fun looking ride. 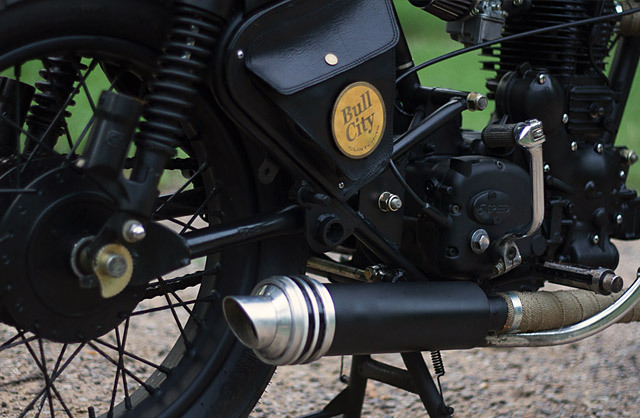 We’ll leave the last word to Bull city: ” We wanted to build something you’d imagine riding across the Himalayan foot hills and also something you could take out for a beer without a second thought.” We’ll drink to that. 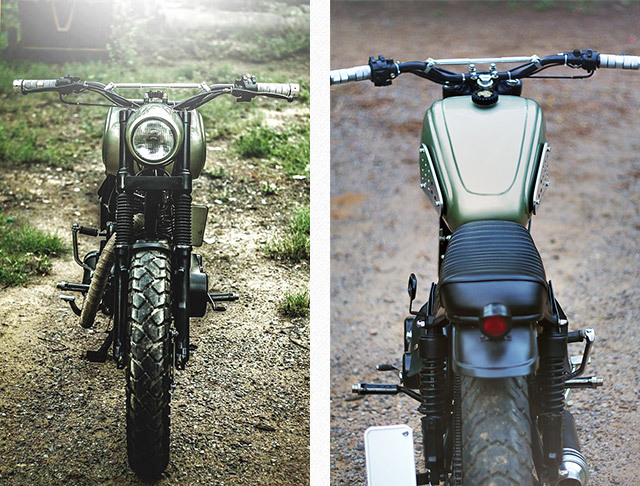 Bobbed Indian Sport Scout Leather saddle, replaced fuel injector with mikuni Carburetor. Custom Paint job. Lots of parts came from friends or we already had and were waiting for the right bike to come along. 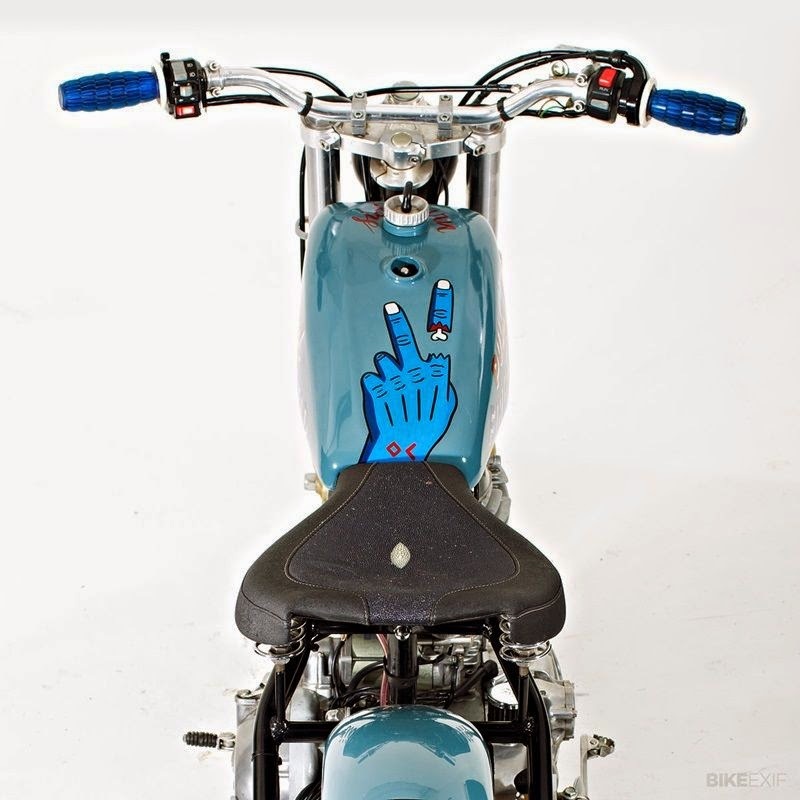 The alloy tank was custom-made for a friend’s dirt track race bike, but he was never happy with it, so we bought it for a fraction of having one made. The Bimota YB9 triple clamps and Paoli forks were £120 off eBay. Photos by Paul Bryant Photography. 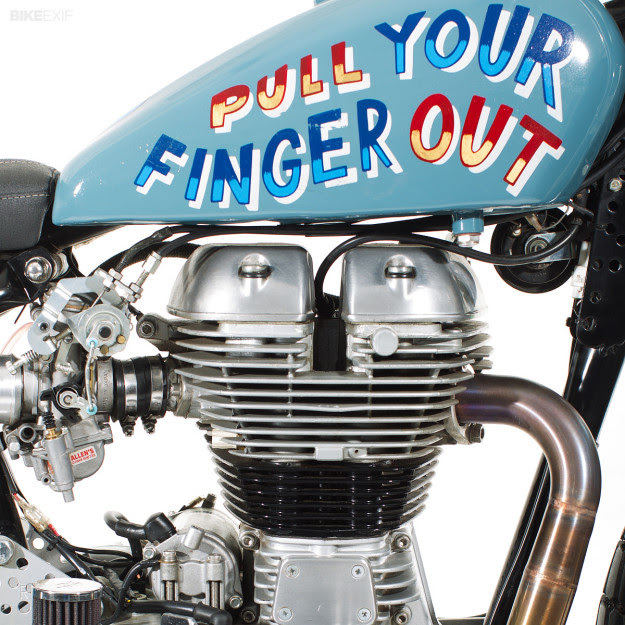 The highly recommended Sideburn magazine lives online here. 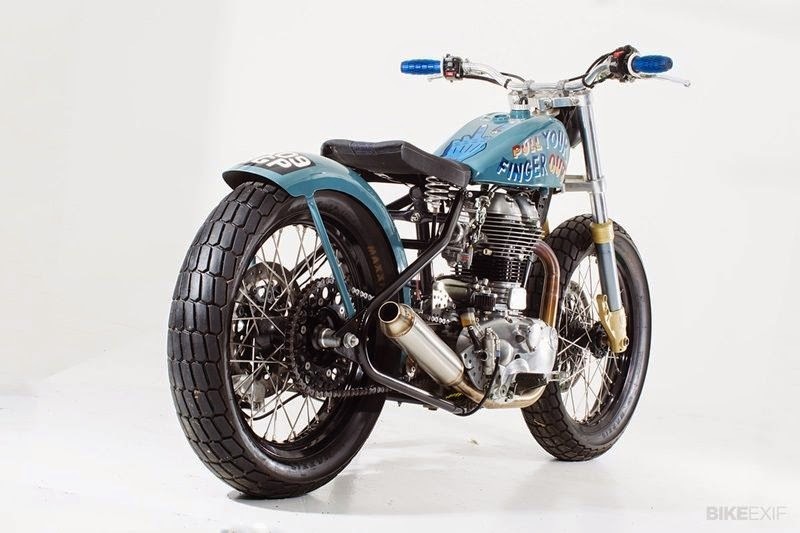 The post Sideburn Royal Enfield Bullet appeared first on Bike EXIF. The new video of GoPro – The Highest Road of the World – is out, and we have more than enough reasons to be super excited about it! First, the main video for Hero3+ cameras has already received more than 12 million views. 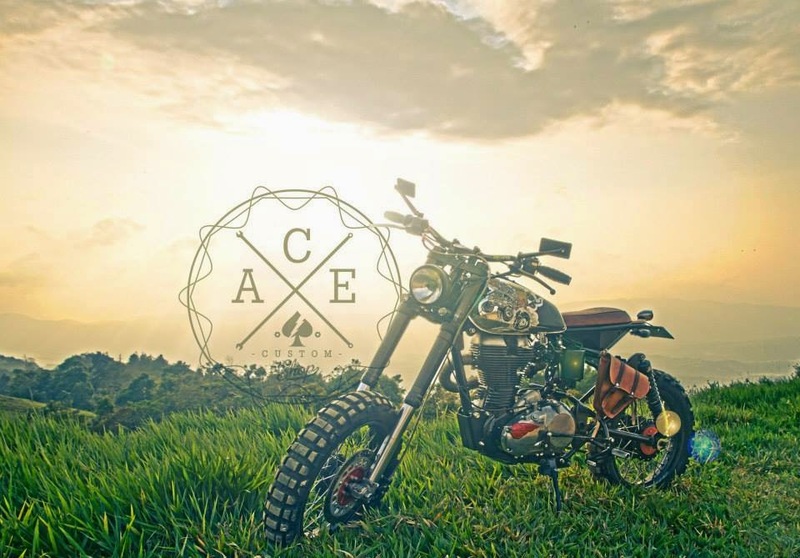 Second, it’s a full video about Royal Enfield touring in India. Third, the video features Alex Chacón, the guy who did 80,000+ miles in 500 days across the Americas. And finally, most importantly, it is the Vintage Rides team who contributed to this mind-blowing video by providing all the logistics for their motorcycle journey across India – yes, exciting! Having been contacted during the busiest season of the year, and with very short time to prepare for the trip, we are happy everything went smoothly and according to plan. We assisted the GoPro team by creating a tailor-made tour in Delhi, Jaipur and Ladakh according to their interests, then providing the Royal Enfield bikes, a mechanic and a backup vehicle, booking all the accommodation and transportation for the trip, as well as getting a tour leader for the tour who was no-one else but Alexandre Zurcher, the director of Vintage Rides, himself! We also have to give huge credits to the GoPro team: Yara, who was managing the project from the US, and James and Zak, who came to India to do the shooting. The two guys were completely rad, yet really really professional and a true pleasure to work with! As Alex is the main person featured in the GoPro video, we decided to do a short interview with him and share it with our fans – enjoy! 1. Having covered more than 80,000 miles across the Americas, how did you find the riding experience in India? India is a challenging country to drive through, not because of the rough roads, but because of the people, culture and ideology behind what it means to travel on the road. It was fascinating and challenging at the same time, a wondrous mix of overpopulation, livestock road hazards and everyone in a loud honking flurry of impatience and always being in a hurry. It was unique, amazing, and will change your perception on what driving a motorcycle along with millions of others is all about! 2. 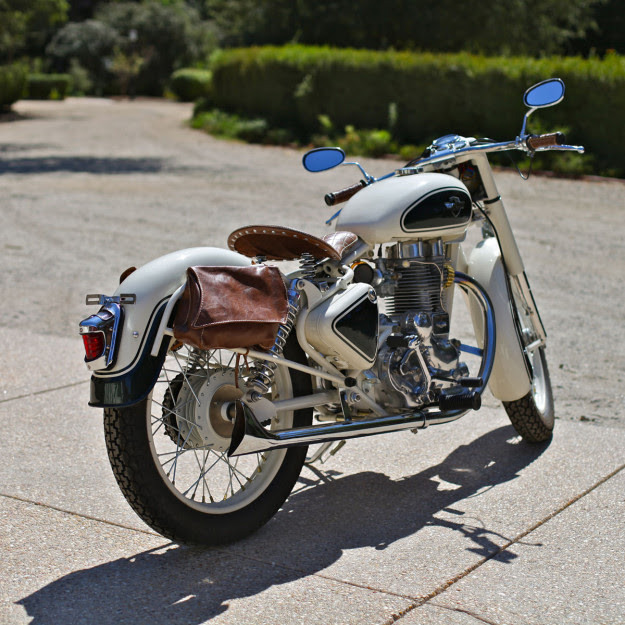 Was it your first time riding on a Royal Enfield? 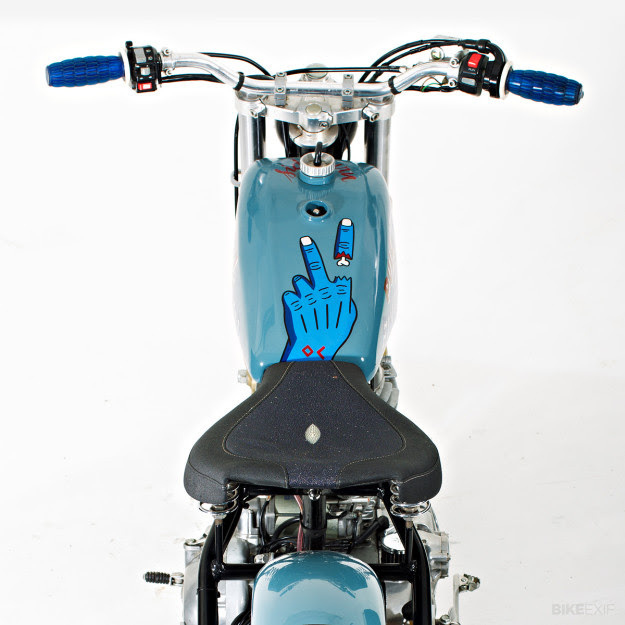 How did you like the Indian Bullet? Yes it was my first time on a Royal Enfield. 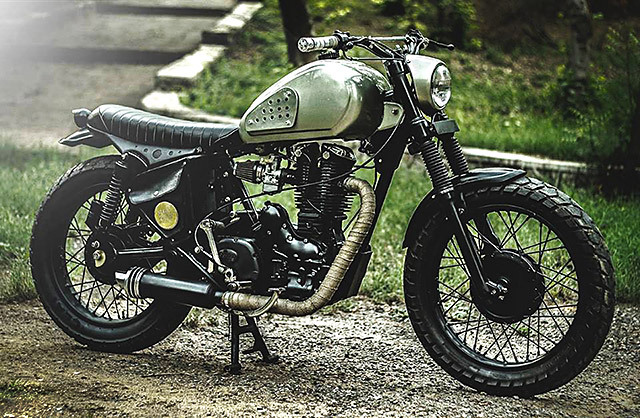 The bullet was a great, classy looking bike with plenty of power to enjoy the on and off roads of India. 3. What was the most challenging part of this trip? The most challenging part was having to go home. It was so amazing to be around so much culture, amazing scenery and people that it was difficult to leave. 4. The most memorable experience? I think being engulfed by the vast expanse that is the Himalayas made me feel incredibly small yet so big at the same time. Looking up at the stars at 6000 meters above sea leave was the clearest I’ve ever seen them my entire life, it felt was if I was traveling into the sky as I ascended up and down the mountains. 5.What’s next on your list? Africa is next on the list. 6. What would you say to the Vintage Riders? 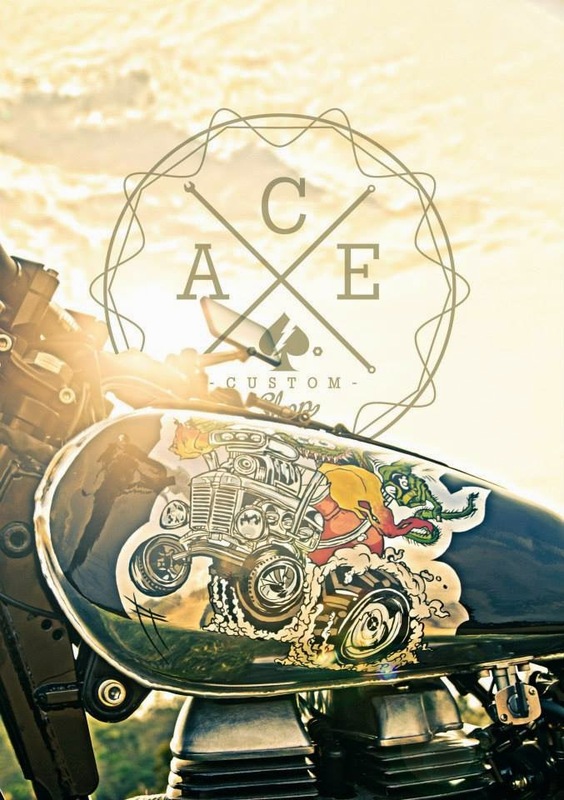 Enjoy the hassle free experience Vintage Rides will give you, they will allow you to truly enjoy a slice of the true and cultural bomb that is India in a very unique and genuine way you’ll never forget! Read more about Alex’s experience in India on his website: Alex Chacon on GoPro hero3+ Launch Video! 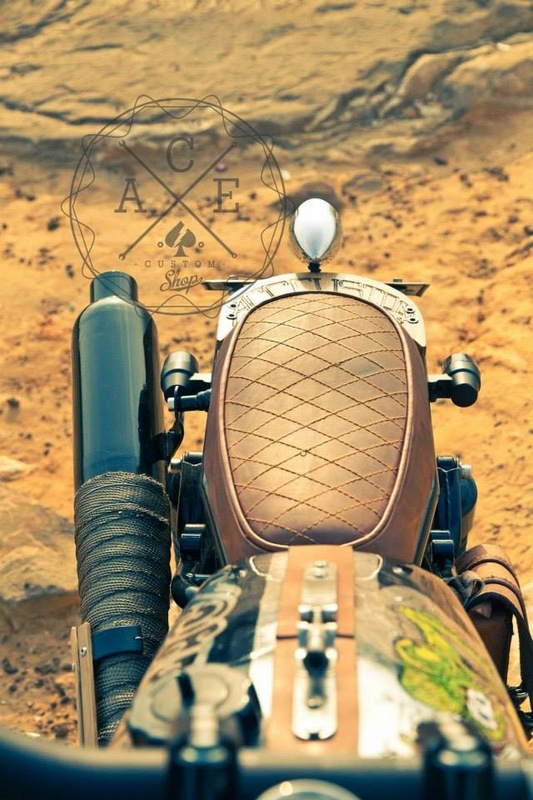 India by Royal Enfield, and follow him on his Facebook Page: Alex Chacon!